Ensure you are fully prepared for your Life in the UK test with the only official handbook on which the Life in the UK test is based. This essential handbook contains all the official learning material for the test and is written in clear, simple language - making it easy to understand. The Life in the UK Test is taken by people who wish to apply for Indefinite leave to remain in the UK, or for British citizenship. We recommend that you should start your revision at least three months before taking your test. This will help with your test preparation and give you a better chance of passing first time. You will be tested on information in the Official Life in the United Kingdom A guide for New Residents, you should study this book to prepare for the test. There are other revision aids available to use with the Guide. These are shown below. 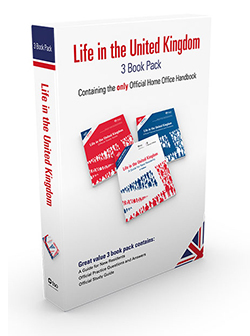 This complete official Life in the UK pack contains everything you need to ensure you are fully pre-pared to pass the Life in the UK test. This pack is for those taking the new Life in the UK test and includes the following four publications . Saving you £13.96 when purchased as a full pack. 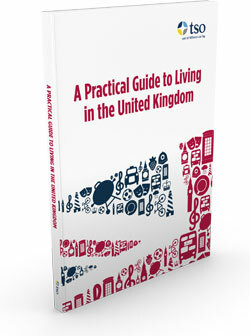 This 'Practical Guide to Living in the UK' supports new citizens with the information needed to adjust to everyday life in the UK. It is packed full of information about living and working in the UK and will give readers guidance on how to get by in daily life. If you are planning on taking your Life in the UK test the Official Practice Questions and Answers will help you fully prepare for your test. It will help you to become fully prepared for your test and is perfect for study when you are on the move. Prepare to pass your Life in the UK test first time with the only official range of Life in the United Kingdom publications. 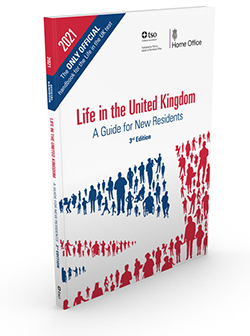 If you are taking the Life in the UK test, you must read the official Life in the United Kingdom: A Guide for New Residents, 3rd Edition handbook. This essential handbook contains all the official learning material for the test and is written in clear, simple language - making it easy to understand. 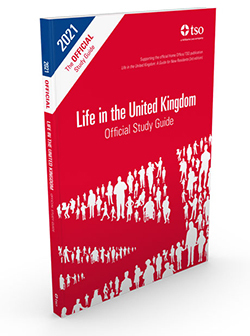 You may also find a copy of the Life in the United Kingdom: Official Study Guide and Life in the United Kingdom: Official Practice Questions and Answers book useful. These publications are available in a range of formats to suit you.